Today should have been the day the UK officially left the EU. But Parliament still hasn't come to an agreement on the best way forward for Brexit. On Thursday, the Commons Leader, Andrea Leadsom, revealed the government would give MPs another vote. The government tabled a motion to be debated in the Commons on Friday about Brexit. But unlike previous occasions, where MPs have been talking about the entirety of Theresa May's deal, this time it is just the one of two elements. Part one is the withdrawal agreement - the legally binding document that sets out the terms of the UK's departure from the EU. This includes a settlement, details of a transition period for after we leave and protections for citizens' rights. It also includes the controversial backstop, or the insurance policy that aims to prevent a hard border returning to the island of Ireland. Part two is the political declaration - non-legally binding document that outlines plans for the future relationship between the UK and the bloc after exit day. The government will only put part one - the withdrawal agreement - to the Commons for a vote. Why has this plan come about now? Mrs May has put her whole deal to Parliament twice in what were called "meaningful votes" to secure her deal, but both times her plan has been voted down by historic margins. After it became clear the government would not be able to pass the deal and complete all the legislation by the original Brexit date of 29 March - today - Mrs May asked the EU for an extension. They said that if the withdrawal agreement was agreed by MPs by 29 March, the UK could then have until 22 May to sort out the paperwork. If not, the UK would only have until 12 April to come up with an alternative or face leaving the EU without a deal. Then the Speaker, John Bercow, warned the government they could not bring back the deal for a third meaningful vote unless it had changed substantially - seen by some as torpedoing a quick return to the Commons. Ministers have been trying to win MPs over to back the deal and this culminated in Mrs May offering to resign to allow someone else to lead the next set of negotiations with the EU - on the proviso they voted for it when it came back to the House. By splitting the withdrawal agreement from the political declaration, the government would adhere to the rules set out by the EU of agreeing that section by the 29 March - meaning the extension of 22 May would stand. How is the day in Parliament unfolding? MPs only sit on a Friday to debate private members' bills - but they more usually use the day to carry out work in their constituencies. But they are sitting today for this debate and vote. Proceedings began at 09:30 GMT, with votes expected at about 14:30 GMT. The government has tabled a motion on the withdrawal agreement to allow MPs to debate it. It is an amendable motion, which allowed MPs to put forward their own changes to it. 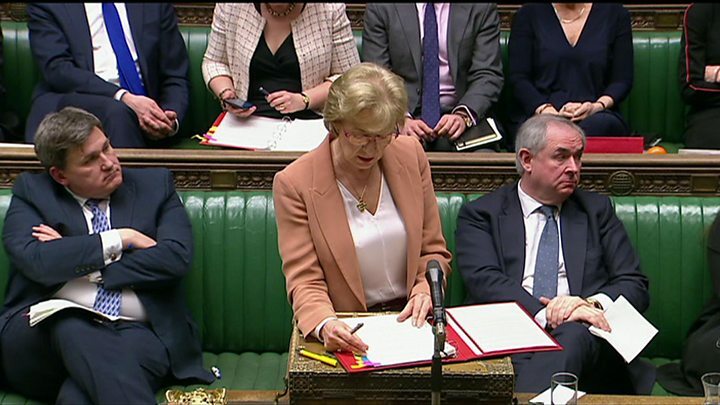 Three amendments were tabled - on revoking Article 50, giving Parliament more say over the future relationship and giving the devolved legislatures in Scotland and Wales a say over future Brexit policy - but none of those were chosen for debate by the Speaker. Once the debate is finished, MPs will vote on the motion itself. If MPs approve the withdrawal agreement on Friday, they will have met the requirements to push exit day back to 22 May. But under current law, it would not be enough to ratify the whole deal because only one part would be approved. If the withdrawal agreement does not get approved, ministers will have until 12 April - the date by which the UK would have to indicate whether it would stand candidates in the European Parliament elections in May - to "indicate a way forward". The EU's chief negotiator Michel Barnier said the choices will be leaving without a deal or a having a longer extension - involving taking part in the elections. It would also be expected that the EU would hold an emergency summit to decide if the conditions for a longer delay are met.